Flyer The Consul of Bordeaux. Already presented in many film festivals across the globe, The Consul of Bordeaux narrates the true story of a Portuguese diplomat and rescuer Aristides de Sousa Mendes. Acting against the strict orders of his government, within a short period of time in May and June of 1940, he managed to issue 30,000 Portuguese visas to people who in desperate attempts to flee Nazi occupation sought help from the Portuguese Consulate in Bordeaux. Upon learning this news, Portuguese dictator Antonio de Oliveira Salazar ordered Sousa Mendes’ arrest and trial. Stripped from his position, he died in poverty in 1954. Throughout the work of the IRWF, the actions of Sousa Mendes have been honored on many occasions, a compilation of which is available on the IRWF’s website. 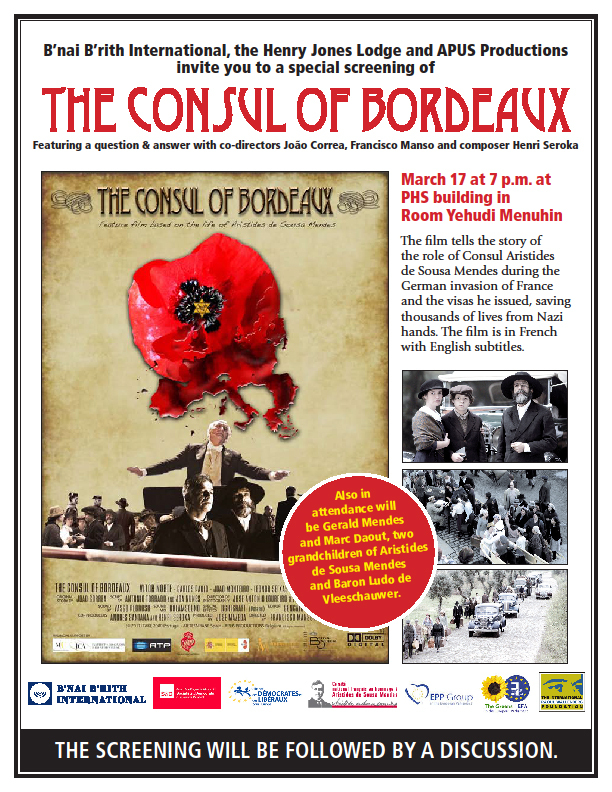 On the 70th Anniversary of the Holocaust the producers of The Consul of Bordeaux are currently raising funds for a new educational initiative that aims to bring the story of the brave Portuguese Consul to a broader auditorium through organizing educational conferences in schools, synagogues and universities. 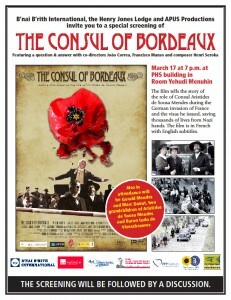 The conferences, which will also include the screening of The Consul of Bordeaux , are planned as multidisciplinary educational platforms that will offer different perspectives of historians, film-makers and the members of Sousa Mendes family with hope to present the life-saving deeds of the great rescuer in all its details and magnitude. 100% of the funds donated through the IRWF will be directed toward the production of The Consul of Bordeaux educational conferences.